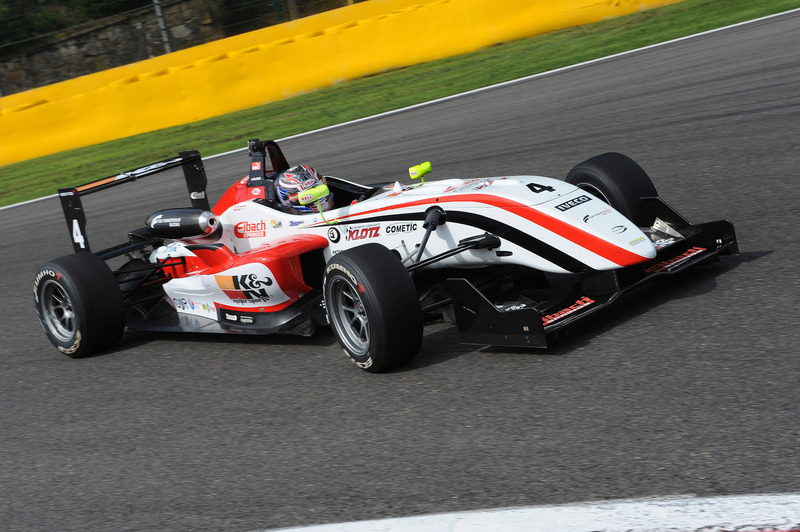 05/08/2011 - As foreseen by the very good laptimes set in the free practice of this morning, Michael Lewis has been the fastest in the qualifying of the fourth round of the Italian Formula 3 Championship at Spa-Francorchamps. Second in both free practice sessions but topping the charts of the virtual "ideal time", the Californian driving for Prema Powerteam set the fastest time in qualifying at his second lap, completed in 2´15.548, at an average speed of 186.018 km/h. Nobody managed to improve this later on in the session. Raffaele Marciello got close to his team mate's time even if, after being the fastest in free practice, he aimed to get the top spot of the grid that just slipped out of his hands for two tenths of a second. The second raw will be occupied by the French Maxime Jousse (BVM-Target) and the Facu Regalia (Team Ghinzani), while the Brazilian Victor Guerin (Lucidi Motors) completed the Top-5 that is all made of rookies. The classification leader Edoardo Liberati (Team Ghinzani) was slowed down by setup problems that he suffered also in free practice: he will start race one in sixth position, right ahead of the two BVM-Target cars of Sergio Campana and Brandon Maisano. The French driver pupil of the Ferrari Driver Academy will have the chance to counter-charge in race two, starting at 10.10 (GMT+2) on Sunday when he will start from the pole position due to the top eight grid inversion. Andrea Roda (Prema Powerteam) was author of his best qualifying of the season as he set the ninth fastest time, less than a second from the pole position and enjoying 22 thousands of advantage to Kevin Giovesi. Lucidi Motors' driver occupied the top of the classification but his laptime was then voided as he went beyond the track limits in that lap. An unlucky episode had Eddie Cheever (Lucidi Motors) and Federico Vecchi (LineRace-CO2 Motorsport) as protagonists with the two colliding while avoiding to bump into slower drivers getting into the pits. Cheever's car removal red flagged the session with 7'27'' to the end and the drivers order was not changed at the restart. The only drivers that managed to improve their laptimes but not their position were Guerin improving from 2´16.109 to 2´15.980 and Campana improving by 13 thousands and setting a fastest time of 2´16.295. The appointment is now for tomorrow with race 1 starting at 16.20 (GMT+2).